This post was originally published at å¤©é«˜çš‡ä¼é¹…è¿œ. I don’t even know what’s going on here. 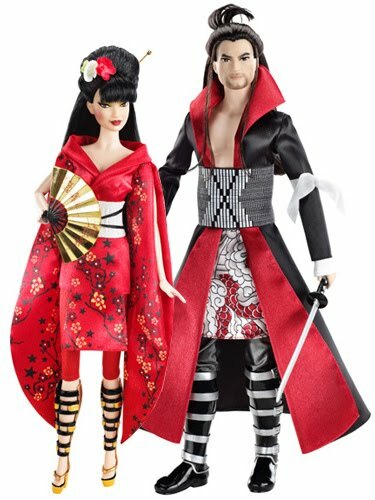 This toy website tells says that Japan Ken wears ‘Japanese-styled clothing and a samurai-inspired sword.’ Japan Ken, if you are Japanese, why is your clothing Japanese “styled” and your sword samuri “inspired”? A (former doll collecting) commenter in this Racialicious post comments that apparently Mattel intentionally went with a futuristic look, which I am totally in to. I would love to know more about futuristic Ken and Barbie in a world clearly at some point heavily Japanese-influenced – but then why are they Japan Ken and Barbie? There is definitely a whole lot of fetishisation and exotification in here, and not that I want to be all ‘hey Asian skin doesn’t look like that’ because there are light-skinned Japanese people, but I feel like it is not going out on a limb to say that those Barbies, if they were sans their Japanese-style future clothes, would look awfully Caucasian. Just like all the others to come before (except for Geisha Barbie and Chinese New Year Barbie, of course, who were no less exotified but at least…kinda looked Asian?). I am totally in to the idea of ethnically diverse Barbies (though I have many Barbie-related issues), but this fake ‘oh it’ll do’ is not it. This entry was posted in Uncategorized and tagged stereotyping, toys on 2010/09/22 by Stephanie. I assume they’re designed exactly to sell as well as possible, for as high a profit margin as possible, and that this is what Mattel’s market research pointed towards. As an alternative, I’d like to recommend Feral Cheryl, but unfortunately production has been suspended. This is pretty much the universal defence of sexism, racism, othering and so on in products though: it sells. * So… it’s not especially novel to point it out. The question is what to do then, and there’s arguments in favour of both supporting alternative products and demonstrating to the designers that they can’t turn oppression into money without copping some noise, and perhaps ultimately noise resulting in an impact on sales. Sorry, I didn’t mean that to sound like a defence. But, as you say, it’s not particularly novel to point out. Incidentally, a non-commenter reader points to http://en.wikipedia.org/wiki/Earring_Magic_Ken as an argument that Mattel is not solely interested in sales volume.